The Brick Castle: My Year With Gary The Cat. So exactly one year ago yesterday, I, the self-proclaimed hater of cats, won a cat. He turned up screeching and crying, and very grateful, and repaid our kindness and hospitality by needing 3 operations and costing about £1.5k in his first year. Happy Garyversary! Gary's arrival was a surprise early one morning, and he's followed me around my house like a puppy ever since I opened that door. I have tripped over him more times than I want to think about, and if I stand in his pee in clean socks once more I'll scream, and maybe cry a bit. Called Gary by our 6 year old "because that's his name", he's very fond of football and will carry a ball upstairs and throw it at you when you're asleep. Playing 'catch' with a cat at 4am is not my favourite thing. Gary's owner never came forward. A year ago I imagined an elderly lady whose cat escaped as she was being stretchered to hospital, and she'll want it back when she gets home. Within 6 months that previous owner vision changed to a 30 year old bloke running into the garden, dropping the cat and running off. During that time Gary had already needed his bladder surgically emptied twice because his willy was too tiny. Turns out size does matter....especially when you scale it down to a cat-sized tinkler. 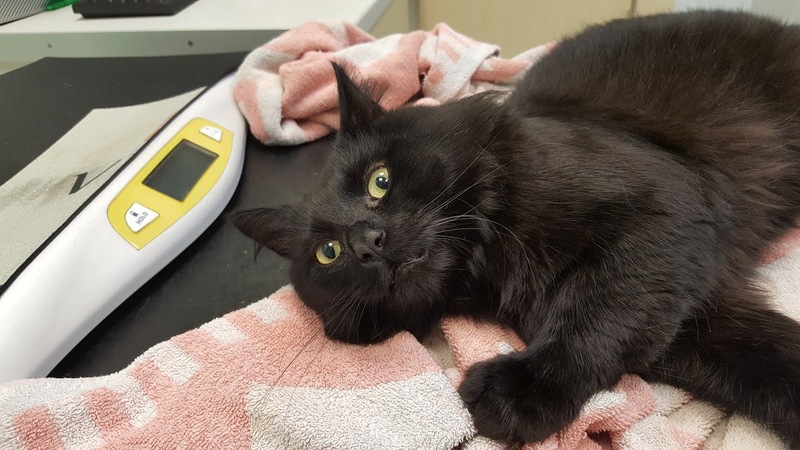 Major surgery was Gary's only real chance of a healthy survival and normal cat life. Crystals in his pee would keep blocking his pipework and I don't have £180 every couple of weeks to take my cat for surgery, nor is it a great deal of fun for the cat. £300 bought a full scissor job (and the vet was lovely enough to let me pay in installments). Sorry for any men reading, but Gary has had to learn to cope minus his meat and two veg. He pees a charm. No problems at all. Overall I'd say Gary is value for money. So far he's cost us £12.50, but that should be good for another 7-8 days. Initial set up raises the average, but ongoing costs can be around 18p a day as standard. There is a risk of vet bills, but aside from regular booster vaccinations, these are unknown and hopefully won't be a regular feature. And that's where I left it. I didn't post anything else publicly, I didn't dare. I did post privately though, and a lovely blogger called Emma secretly told everyone about Gary our ridiculously expensive rescue cat. She suggested people help by sending Gary the price of a cup of coffee, and I was actually on the sign-in desk at Blog On when I realised something was happening. I was getting tons of emails from Paypal from names I mainly didn't recognise, saying they'd given me little sums of money from 75p (I'm guessing Yorkshire) to £3.50 or more (Caramel mocha hocka chai latte with a shot and sprinkles probably). Lots of the emails had lovely 'Get Well Soon' messages for Gary. They didn't even know he'd just had his entire everything lopped off. You guys raised us over £200 in the end - That saved my family from having a fortnight of mystery soup, tinned peaches and whatever else was at the back of the cupboard until payday. Genuinely, that cat had broken us. If I meet you, I owe you a coffee. Thank you. 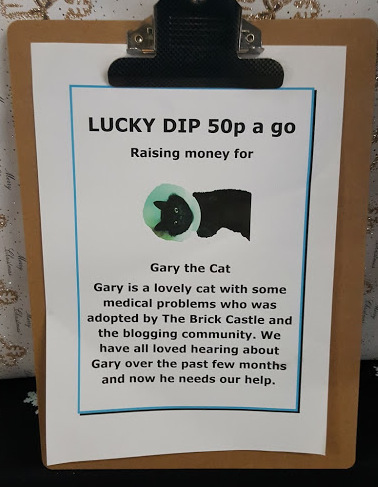 While I was still trying to get over that, I was shown the Blog On Lucky Dip Box, which also was raising money for Gary. Full of absolute tat that Laura had swept up from under the sofa, plus some really nice goodies (think Smiggle), it's astounding how much money grown humans will pay to grab a random parcel from a box and unwrap it. I had 4 goes. You guys raised us £123.70 at 50p a ticket. Thank you. 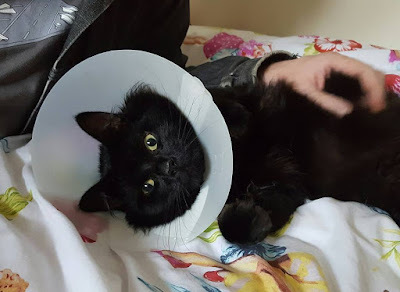 And so tonight, several months after his operation, Gary is now healthy and happy and couldn't really be more a part of the family (although there was that one time he escaped into the garden and we didn't notice for 2 hours). He visits everyone in turn when they go to bed, to check for evil tabby cats and guard the window for a while. We've had no tabby cat incidents since he's been with us, so, successful. He also keeps the rabbits in check by sitting on chairs and batting at them as they walk past. He did infest the house with fleas though, that was quite stressful, but a learning experience. Just ask my son what diatomaceous earth is if you ever have half an hour 5 minutes. Because he was ill - that's the only reason - Gary sleeps at the end of my bed. He's only allowed to sleep in his deluxe cat bed and he keeps to that rule. This is his 4th bed, and definitely his favorite. A keen interior designer, he's remodelled quite a lot. He seems to sleep for about 22 hours a day. I had no idea cats were so lazy. 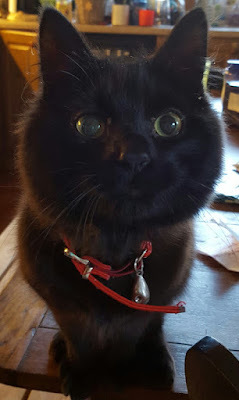 Huge thank you to Sim for this post, because if she hadn't given me a lift to the vets, and hadn't leapt up off her chair and shouted "Woooah. There has to be another option". There would be no Gary. She doesn't really like cats either. Ahhh, Gary's arrival is genuinely one of my best days on the internet ever. I still chuckle thinking about it. He's a lucky cat, he definitely landed on all.four paws when he yowled at your door. See you cat haters, you're all the same! Saving one cat at a time!!! I think I had about 5 goes on that tombola and kept putting my winnings back! Someone thought I was cheating but I genuinely just wanted to help Gary rather than that old tat Laura found under her couch! I didn't get any of the good stuff! Damn that Gary!!! We Heart Gary ...PS He really needs his own Insta account!!! I so enjoyed that Jenny. 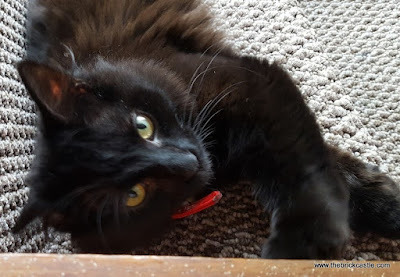 I'm not a crazy cat lady either but having lived with at least one cat almost my whole life, I could not imagine life without one. Animals are not 'just'animals', they are just like us - all indivuals with personalities, idiosyncrasies, good and bad habits, and for that, they enrich our lives and reward us by choosing to be our companions. Our current companions are two moggies, one of whom was scraped frozen and injured from an icey road one morning at 5am. She too cost us dearly to put right but turned into a delightful and sweet girl. She is now 16 (mid 80s in cat years) and has the feline equivalent of dementia. She also has something nasty growing internally, for which she is being treated. For the moment, she is happy and pain free, and still craves contact and affection, however, when and if her condition causes her to suffer, we know we have to show her the ultimate act of love, however painful it may be for us. You've got to love Gary haven't you. 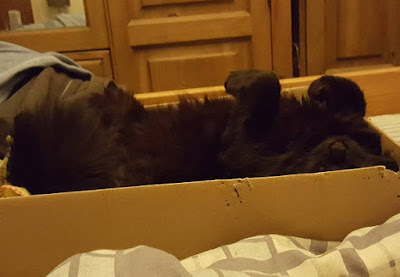 Well done for training him to sleep in his box. I battle with Fidget every night as I wake up body twisted at an unnatural angle because he has taken most of my side of the bed. No matter how often I move him, her makes his way back when I'm asleep. Hee Hee Hee! This made me chuckle.